“Color” and “Structure” are two notions, which always appear in connection with each other in your thinking. How do you understand the relationship between the inherent structure of color and its gradients, and the structures that you introduce in the painting as lines, grids, and geometrical shapes? How does the former help to reveal, to hide, to blur, to fade, to emphasize, to scale, to rotate, to shift, and to bend the latter? Can one mentally ‘sketch’ out the color/structure effect before painting? I believe in painting’s ability to choreograph color and form in infinite compositional variations. Color composes geometry to function in a supportive way to the color concept. Color does have a structure indeed; this structure is described in atlases of color, as for example Albert Munsell’s. Hue, value and chroma are the three coordinates of color referencing. These are contained in a spatial configuration, which is not a perfect globe, but it is more infused within a spheroid; on the top is white, black is on the bottom, and middle-gray is theoretically between white and black. There are steps of gray between white and black, and the colors used are designated by a value. If you play with the color radiant that has a certain value and thus emits a defined translucence, chances are that the value system being used is compatible with that fabrication of light. 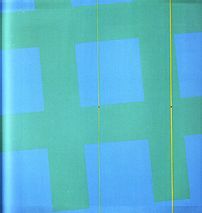 The color value and the geometry of the painting therefore feed back onto each other. This interaction is best described through the process of painting, the proposition of which is constantly changing. I start many of my paintings with an initial sketch, in which I plan the composition of color in shapes. Color is represented by written abbreviations on that sketch. I transpose the sketch onto the canvas in a very thin, tenuous, and watery way as an annotation. After that, I begin to change the shapes; a dance/duet between drawing and color starts to guide the painting. I like to think of color as contained in jars and tubes, to be released at the appropriate time, when the composition calls for it. Color and drawing enter a dialogue, and finally they can say that they have both won. Most of the time, color generates the idea of the painting through its transference to geometry, and enacts the three forces of tension, compression, and shear, which are elements of neo-plastic painting.